San Francisco can lay claim to inventing everything from sourdough bread to fortune cookies, so it’s no wonder that some of the nation’s most iconic culinary history originates within our 49 square miles. Behold, the 34 best single items, from dishes to snacks to drinks, at some of San Francisco’s most classic restaurants and bars (without repeating every spot on our earlier map of 25 restaurants every San Franciscan must try). Disagreement is inevitable, but in our view, SF wouldn’t be SF without the items on this list. There is no greater pleasure in this life than a frosty Anchor Steam. 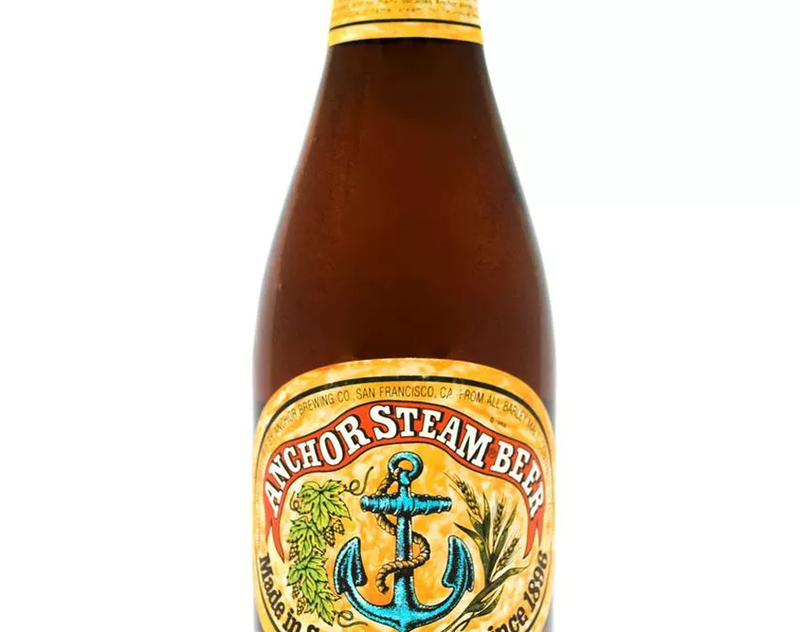 The only steam beer you can buy (it’s trademarked, so everyone else has to call theirs a “California common”) dates to the 1800s, but was revived by Fritz Maytag in the ’60s, making Anchor historic both as an old-school brewery and as one of the first American craft breweries post-Prohibition. This kickass Mission Terrace corner store is known for their Dutch Crunch bread, with that irresistible crisp exterior and soft interior. Whether you stick with turkey or go for the fully-loaded Roxie special, the deliciousness of Dutch crunch sets the stage. The ultimate old-school donut shop, Bob’s provides 24-hour service to the tired, hungry, and occasionally drunk denizens of Polk. All their donuts are great, but the apple fritter, perfectly crisp-soft and laced with plenty of cinnamon and tender apples, is a standout. All of San Francisco comes here on a sunny day for raw shellfish and spicy bloodies, and you should too. The water, the sun, and the vodka will have you swimming in bliss, especially after a two-week stretch of gray and fog. Since 1974, Tom Yasukochi has faithfully recreated a classic cake from his San Francisco childhood — the sticky sweet Coffee Crunch Cake sold at the erstwhile local bakery and restaurant chain Blum’s. But the operator of Yasukochi’s Sweet Shop inside the Super Mira store in Japantown learned to bake under deeply unhappy circumstances. He and his family were sent from San Francisco to a Japanese internment camp during World War II, and during that period, near Salt Lake City, Yasukochi recalls learning to bake as his father worked in the kitchen. After the war, he and his family returned to San Francisco, where he graduated from Lowell High School in 1955. 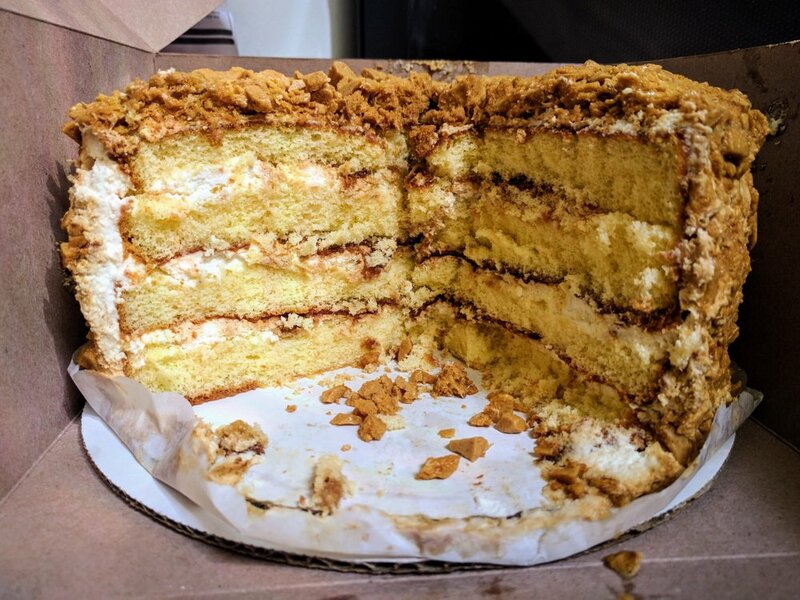 Later, he perfected the Coffee Crunch Cake with the help of a former colleague who once made candy for Blum’s. It’s particularly popular around Thanksgiving, so if you want a whole one, be sure to call ahead. Many a potential hangover has been staved off with a 3 am bowl of this restorative Portuguese elixir, with potatoes, kale, and plenty of zippy linguica sausage. The setting in an adorable converted cable car isn’t half bad, either. Fans shouldn’t wait to snag a bowl, since the fate of the building rests in the hands of new owners ( with possible development plans ). Farolito, patron saint of the Mission’s hungry drunks, is open late at night, which is the best time to eat their gloriously messy, greasy, flavorful, delectable carne asada super burrito (WITH rice, thank you very much). Waiting in line for 30 minutes for one of these is a great immersion into SF’s melting pot. The burrito does not discriminate, especially when you are imbibing. Rather than risk the ire of burrito partisans by including only one of the two biggest hitters, we decided to have them both on this list. First up: La Taq’s world-beating carnitas, served with the perfect liquidy ratio of beans and salsa (but no rice) in a warm tortilla. There’s a reason this won America’s Best Burrito. The polar opposite of a dense, New York-style cheesecake, Zanze’s cake is light as air, practically souffle-like in its delicacy (you need a taut string to cut it). They’re only sold whole, with a dusting of graham-cracker crumbs on top and bottom, and the leftovers taste particularly good when frozen. Locals may not eat it much, but you can’t deny that when the rest of the nation thinks “San Francisco,” this is the first food that comes to mind. Sure, clam chowder is an East Coast invention, but sourdough makes it that much better, and you can’t argue with warm, hearty soup on a chilly summer day by the water. At Sotto Mare the cioppino is portioned for two, so either bring a big appetite or a friend. The rich tomato-based broth is filled with Dungeness crab parts, mussels, calamari, and more, served in a metal bowl with ladles, bibs, and a loaf of crusty bread. It’s best consumed within the tiled, narrow, and deeply decorated dining room that’s been serving this classic for decades. There are many things to love about Tartine Bakery, from the croissants to the bread pudding, but nothing is more iconic than baker/owner Chad Robertson’s country bread. The tangy, perfect crumb inside is surrounded by perfectly blistered crust, making it the ideal vehicle for butter, jam, sandwiches, or just torn off by the handful and consumed on its own. 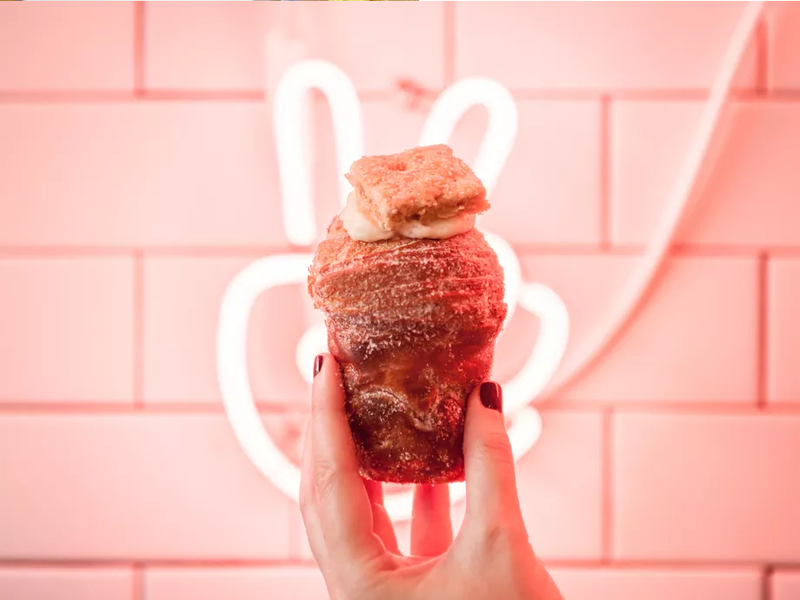 It’s Instagrammable, it’s endlessly adaptable to fillings and flavors, it’s inspiring of long waits: It’s the cruffin. 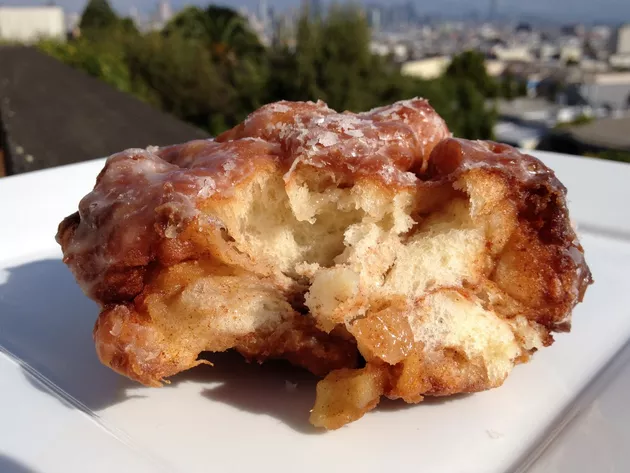 A new SF icon has emerged, showcasing the city’s love of innovation and excellent pastries in a mashup between a croissant and a muffin. If you can catch them while they’re open (a highly variable proposition), Golden Gate’s dan tat are about as good as they get: flaky, creamy, buttery, generally to die for. Long before hipster coffee shops popped up in every neighborhood, Caffe Trieste was fueling the Beats with its buzzy wares. Later, Francis Ford Coppola wrote The Godfather in this very shop, hopped up on the same heady brew. It’s certainly an argument for the creative mojo engendered by a cup of Trieste espresso. A favorite of legendary chef Cecilia Chang, the explosive chicken is a showstopper. Deep fried chunks of chicken are presented atop a terrifying pile of dried chili peppers, indicating that this dish means business. However, the heat isn’t overwhelming (just don’t eat the peppers, they’re for decoration) and the chicken is flavorful. Just reserve a table ahead of time— the secret is out on this one. It’s hard to explain what strange alchemy goes into Liguria’s focaccia, but it might be magic. In any case, it certainly compels people to get up early and stand in line for a slice or two before they sell out, and has since 1911. Eat your pizza foccacia warm from the bag, or head down the street to equally historic Mario’s Bohemian Cigar Store to enjoy it in an oven-baked meatball sandwich. Tadich is a font of iconic dishes: the cioppino and sand dabs were also strong contenders. But for the sheer San Franciscan hubris of putting bacon and fried oysters into an omelet, we have to give it to the Hangtown Fry. No, it’s not setting any new culinary standards, but in terms of ridiculously beautiful rooms that will make you feel insanely fancy, the Garden Court is the one to beat. 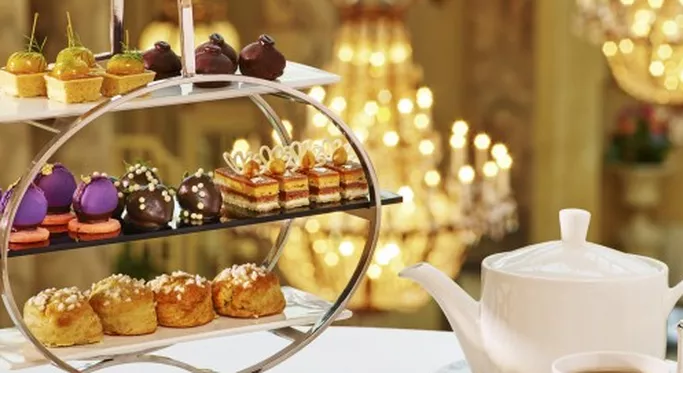 Come here for a ludicrously expensive high tea, and you’ll feel like the Queen as you daintily bite into your finger sandwiches and scones. Sure, it’s a tourist obsession, but the Buena Vista does make a damn good Irish coffee. Also, it combines coffee and alcohol and dark wooden bars, three things San Francisco adores. Bruno Mooshei, the famously cantankerous bartender at this Haight icon, passed away in 2000, but they’re still honoring his memory one martini at a time. With three ounces of gin mixed in a “1000 to 1” ratio with vermouth, it’ll get you lit in no time flat, the better to enjoy the Middle Eastern vibe. Any seafood at Swan is guaranteed to be fresh and fantastic, whether you’re opting for half a cracked Dungeness, a bowl of chowder, or a shrimp salad. 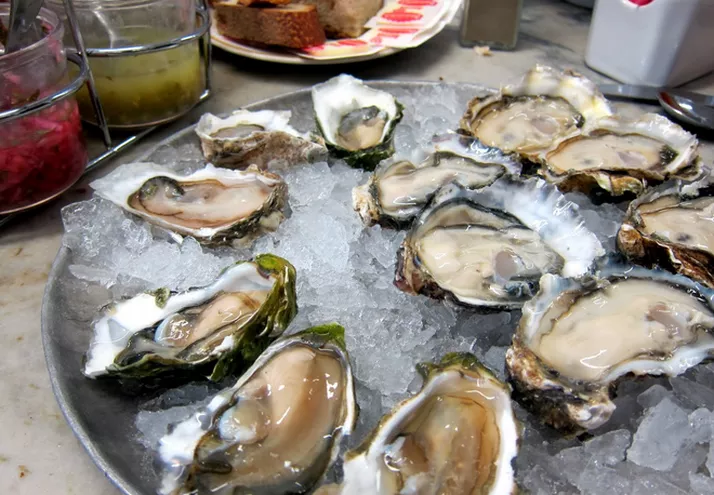 But you can’t come to a place with “Oyster Depot” right there in the name and not eat oysters, especially the amazing local ones. A stroll along 24th Street isn’t complete without a pan dulce from this adorable Mexican bakery, in business since 1951. They’ve hipped things up in recent years with fancy new-school pastries and De La Paz coffee, but the original treats are the best. Sure, it’ll cover your sodium intake for the week, but who can resist the juicy, carved-from-the-cart prime rib at HOPR? Accented with a mound of creamed spinach, plenty of au jus, and some Yorkshire pudding on the side, it’s a ticket to meat heaven. It’s hard to say more about this one than has already been said. The brick-oven-roasted chicken, with its crisp skin, is fantastic, but it’s the chunks of crisp bread, arugula, and currants coated in chicken jus that really makes it special. Share it with someone you love, or steal all the salad when someone you hate isn’t looking. San Francisco really has become an iconic ice cream city, from Mitchell’s and Swensen’s to, now, Bi-Rite. The salted caramel is toasty, rich, and perfectly delicious paired with any of the creamery’s other flavors. Equally iconic: the line that appears on hot days and wraps down the block. In a pinch, check out the adjacent soft-serve window for a quicker fix. Since 1979, Jacqueline Margulis has whipped up hundreds of sweet and savory soufflé miracles one by one every night at Café Jacqueline. Now in her ’80s, Margulis remains a one-woman operation — the restaurant must close when she’s sick or on vacation — and she still practices the techniques she learned in her native Bordeaux, France, where she was raised in a convent and later attended culinary school. 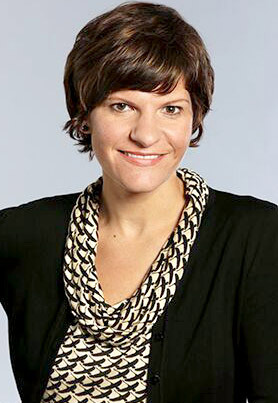 Her airy, entrée soufflés come in varieties like mushroom gruyere, crab, and white corn ginger garlic. Split one at romantic tables for two, and then order a dessert soufflé in chocolate, lemon, or made with Grand Marnier liqueur. Swensen’s is best known for the sticky chewy chocolate, made with some kind of viscous chocolate syrup that makes the ice cream stretchy in the best possible way, but we certainly won’t look askance if you opt for the excellent Swiss orange chip or Turkish coffee instead. Family-owned since 1906, this maker of handmade mochi and manju still has it going on. The strawberry manju, with white bean paste and a whole strawberry encased in tender rice dough, is our favorite, but you can’t go wrong with anything here. It says “Home of Little Pancakes” right there on the sign, and Sears has been turning out delicious ones since 1938. You get 18 in an order, complete with warm maple syrup and soft butter. Breakfast nirvana. Mad scientist/baker William Werner’s masterpiece, the Rebel Within, manages to capture a soft boiled egg within a savory, sausage-studded cake. It’s served with a tiny vial of Tabasco salt for added oomph, and takes breakfast to a whole new level. (Check out a detailed explanation of how it’s made here. Trouble’s slabs of toasted brioche are slathered with butter, then crusted with cinnamon and sugar for the ultimate coffee accompaniment. It’s the OG San Francisco $4 toast, and it’s not messing around. 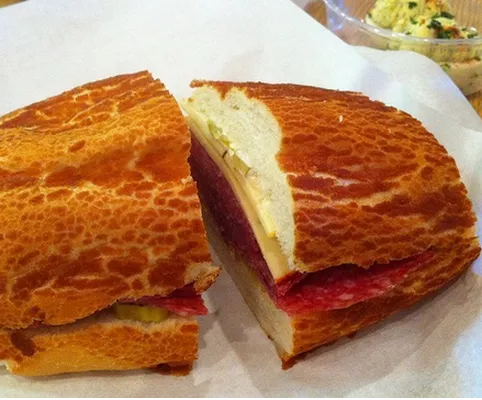 The Oakland and Bay View locations are reliable options for this toasty treat, but the Outer Sunset location is the most iconic place to consume it. Mitchell’s has been holding it down in Noe since 1953, offering both the standard chocolate, rocky road, and strawberry and some decidedly Filipino-influenced flavors, like avocado, buko (young coconut), and our pick, ube, or purple yam. Because when else are you going to get to eat purple ice cream? We know, we know: Yank Sing is expensive (much more so than Shanghai Dumpling King). But their soup dumplings are off the chain, freshly flavorful and perfectly thin-skinned. Plus, you get the interactive element of trying to consume them without scalding the interior of your mouth, which takes real finesse and some artful nibbling skills.